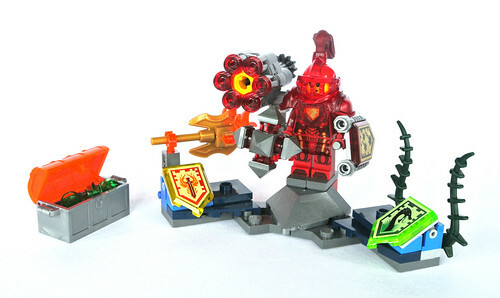 The first wave of Nexo Knights sets includes six 'Ultimate' sets which consist of a minifigure, three Nexo Powers and a small stand for the figure and their accessories. My favourite of the six is 70331 Ultimate Macy, mainly due to the fantastic array of parts and the presence of Macy, who seems like one of the more interesting Nexo Knights characters in the animated series. Each set is priced at £6.99 in the UK and $9.99 in the US so offers excellent value for money in my opinion, particularly given the integration of each set with the Nexo Knights app. Additionally, the minifigures are exclusive to the Ultimate sets which only furthers their appeal.